The hard pat of rain is hitting the skylights this morning, here in Tomball, Texas. 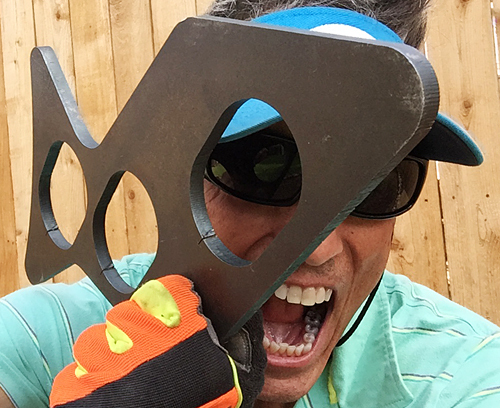 It has been another week of what I an starting to call “down south junkin’,” as I gathered steel from a confidential resource in another part of the state a couple days ago – steel for the startup business “Spark” side of the “Soft Spark Art” venture. It’s only right that the rain is coming down on the 900-pound load of steel sitting outside in the street (on my flatbed trailer), making my work just a little harder than it has to be. What else is new? Quite a catch, and there’s only four of these in the 900-pound stack of steel. I figured I should check in with readers this morning to provide “proof of life” if only for your morning reading pleasure, and perhaps to show you one of the pieces of Spark Art that will be up for sale as soon as I figure out how it will look in its final iteration. For those of you who didn’t know this about my interests, I’ve been a weldor for about twenty years now, and I’ve decided to spend more time exploring its potential (for income and art), as my once thriving photography business has precipitously contracted – around my neck. What you’ll be witnessing in coming weeks and months, here at Texas Fly Caster (need I remind you the Number 1 source for information about fly fishing in the State of Texas?) is a shameless co-mingling of my art and business ventures with our fly fishing adventures — some would say for better, and some would say for worse. Most will say nothing at all. But this is what we’re reduced to in these (Tom Joad) days; taking a heavy traffic site like this and manipulating TFC into more than pay-per-view reading, more than banner adverts, and into a springboard for the things that could keep me from completely disappearing. Obviously it has a clearly impure impact on the content of the reading and visual here at Texas Fly Caster, but the detours are as much needed now as the air I breathe. And if all goes accordingly (unlike this year’s skiff guiding thus far), then maybe we can find more fuel ($) for the fly fishing adventures you’ve come to enjoy from Texas Fly Caster. Once I am independently wealthy from these other ventures, the separation (of church and state) will resume. I’ve been getting a few texts from those returning from exotic adventures, and those who see their summer’s end in sight. Most are looking for a fly fishing fix on Ray Roberts, an attachment to a summer carp on the preferred end of the line. While I have been busy at other ventures (see above), I have heard from friends on the Lake, that the flats are coming into full bloom and fish are being found. Both of my sources for this are also livers of the skiff life, so we are talking about places on the skiff grid, and off the wade grid. A fairly big ugly (fish) – for Lake Ray Roberts at least. Saltwater fly guys got nothin’ on us! As for my exploring, on Ray Roberts and now on Lewisville Lake, the time on water has been shortened to half-days as the heat gets so intense that I have to wear gloves to handle my black Stiffy Pushpole . One would think Stiffy could make them in white, but then that would be way too logical. I won’t soon forget a guy I was talking to by phone in Florida, slamming Stiffy in favor of the Florida Carbon Marine Pushpoles. Forget their pushpoles, and have a look at their tiller extensions. I can testify the weight savings of carbon fiber tiller extension is worth the cost (that I cannot afford). The last outing, before the galavant across Texas, did yield a new lake record for freshwater (black) drum on Ray Roberts though. At 5.75-pounds, it pretty well doubles the current drum-on-fly record for Ray Roberts, and was a true blast to pursue. I pulled him off a rock shelf next to deep (cool) water with that “stupid simple” fly (watch the YouTube video – https://youtu.be/RxeLN7-Wh8M ) – he chased, and neither of us knew he was hooked for a second. Remind me to start carrying a net! All this record hullabaloo does lead to another story that I didn’t dream needs doing: Where to get your Boga Grip certified as a legal scale. If you have a Boga Grip 315 15lb Scale , or even two, you have probably wrestled with the certification process for TPWD’s registering of records at one time or other. Well, let’s just say I found a way to do the Boga certification in Dallas, much simpler and avoiding the shipping (risk) and extreme cost of sending to IGFA in Florida (who trusts any shipping company these days really?). So, I’ll be getting my Boga Grip certified in Dallas this week, and publish a story on that process, and how you can do it locally too! (Yes, you can get it certified AFTER the catch.) 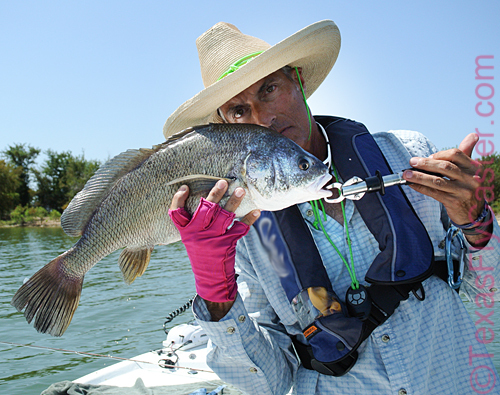 Quite honestly, catching that drum has rekindled my interest in targeting freshwater drum. I saw a few in the double-digit range on Lewisville, and am hearing about freshwater drum being caught all over Texas right now – on fly. If I am allowed to fish this week, it will be either back to Lewisville, or over to Lake Grapevine to take a look at what it offers. Neither of these lakes come close to the beauty of Ray Roberts, but they are closer to the masses. Regardless, I have sworn off weekends on either of these lakes at least until summer is officially over! I know you’ll find me in the Lake Dallas City Hall at least one afternoon this week – squashing a ticket I got while parking at Arrowhead Park – a real trash heap. There’s going to be so much to say about Lake Lewisville/Lake Dallas, that the first installment will probably bore you to death, but should be out this week. We’re only just now beginning to scratch the surface of these other lakes. Have a great weekend wherever you are in Texas, or the world, and we’re going to let this post ride double for the Monday Morning Sidewalk as well. Thanks for reading and get ready to ride a brand new horse, and I’m not talking Tennessee Walker.